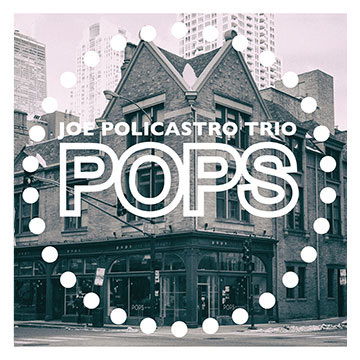 JOE POLICASTRO TRIO - Pops! Joe Policastro: bass; Dave Miller: guitar, Mikel Avery: drums. With guests Andy Brown (5,8), Andy Pratt (4, 11); guitar. Recorded January 3-6, 2016 at Hi-Style Studios. Chicago bassist Joe Policastro has been a fixture of the local scene for a while. He studied classical double bass at Miami University, received a bachelors of studio music/jazz studies at the University of Cincinnati, and earned his Masters in Music of Jazz Studies at DePaul University. The bassist has contributed to a variety of contexts, and the Joe Policastro Trio with guitarist Dave Miller and Mikel Avery, drums; has had a longstanding gig at the club Pops For Champagne where they have blended the traditional guitar trio sound with broader reaching material. It is this broader focus that makes up “Pops”, their second album together. Pop music has always been at the forefront of jazz dating back to the 1920's when Louis Armstrong had a hit with “Jeepers Creepers” while songs from the Great American songbook and tin pan alley strengthened the association. Very rarely have modern pop songs found their way into the lexicon of jazz musicians beyond a select few tunes which have become standards since the onset of the sixties, and recently younger jazz musicians like Ben Williams and Robert Glasper have used the pop music of this generation as templates designed for exploration. That is what Policastro's trio, with the assistance of guests Andy Brown and Andy Pratt (replacing Miller on select numbers) do so well here, mining pop songs spanning four decades from the sixties through the nineties that had not been explored in jazz so much. Policastro's flexible, rich bass serves as a foundation clearly outlining harmonies and occasionally as a second melodic voice while Miller and Avery showcase extraordinary musicianship. Burt Bacharach and Hal David's 1963 “Wives and Lovers” covered by the likes of guitarist Grant Green, receives a reinvigorated reading through the use of a 6/4 meter that doesn't carry the traditional waltz time implications. Instead it provides this wondrous, ambiguous feel that propels Miller's agile lines along. It is the covers of the Bee Gees' “More Than a Woman”, Stevie Wonder's “Creepin” the medley of the recently departed Prince's tunes “Condition of the Heart”, “Diamonds and Pearls”, and the late Billy Paul's “Me and Mrs. Jones” that make the biggest impression. “Creepin'” a lesser known hit from Wonder's “Fulfillingness' First Finale (Tamla, 1974) is probably better known from vocalist Kenny Rankin's version on the terrific “Inside” (Little David, 1975). The tune receives a subtle bossa treatment that gorgeously highlights the pretty chord changes, and Miller's warm, biting, twangy tone recalls Grant Green and George Benson in a beautiful melodic, bluesy turn. Policastro's assured arco bass work is featured on the bridge and the band really cooks on a funky four on the floor outro courtesy of Avery's thumping bass drum, backbeat and prancing ride cymbal bell rhythms. Miller's chicken scratch guitar comping adding extra heat. The Prince medley and Billy Paul pieces function as impromptu tributes to two artists who left the planet while the album was being recorded. “Condition of the Heart” and “Diamonds and Pearls” flow as a deftly executed 15 minute segment of music despite being two tracks. Prince was truly a force and genius in pop music drawing on all genres and so many jazz musicians over the past thirty years, including Miles Davis who held him in high regard. The hip harmonies of the two pieces really suit the trio. “Me And Mrs. Jones” allows for a deep, greasy blue hue. The album closer featuring Andy Pratt, is a cover of The Cars 1984 smash, “Drive” recasts the moody melody and slightly dark chord changes quite well. The original, known for its extensive use of Fairlight CMI synthesizer loses none of the lushness in the stripped down arrangement, Pratt's guitar lending a Bill Frisell, countryish vibe. Policastro flexes his melodic chops with a fine solo as well. “Pops” is an album that demonstrates the depth of well chosen modern pop tunes that lend themselves well to jazz improvisation, in an acoustic straight ahead setting.. Joe Policastro's trio is well honed from their long time live show, and since they thrive on pop tunes, it's a bright indication of the road ahead.